Sandy Klop had her first exposure to the world of colorful patterns while watching Klompen dancers perform. Every year in May her hometown of Holland, Michigan, celebrated tulip time with a vast array of Dutch costumes. 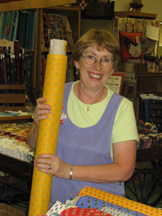 Her creative designs have appeared in several catalogs and many magazines.She speaks regularly on the topic, “The American Jane Story in Fabric”.